It’s time for you to market your business like a pickup truck. That’s because Fiat Chrysler Automobiles (FCA) is about to release their 2020 Jeep Gladiator; a midsized truck based on their best-selling Wrangler four-door SUV. The Gladiator is a nostalgic recreation loosely inspired by Jeep’s original Gladiator pickup truck that was built between 1962 and 1988. When it debuts, the big Jeep will sell for almost $10,000 more than its immediate competitors from Ford and Chevy. According to The Wall Street Journal, there is a “…growing distance between daily transport and a high-capacity lifestyle vehicle…” and that’s the reason Jeep can charge such a high price. The big learning for your business is that the Gladiator’s price – and its price advantage – has nothing to do with the new truck’s functional advantages. Rather it has everything to do with the truck’s emotional advantages. Maybe the current news environment – and Jeep’s pricing strategy – proves that you cannot. Maybe our obsession with consumption of products and discourse has evolved so severely that heartstrings must be pulled on every single issue. Maybe today’s political discourse must be trivialized to get attention. Maybe there is no margin in the middle. Maybe it’s only by inciting an emotional response that can we make our points. Today most products have become indistinguishable from each other and our attention spans have become shorter than ever before. We no longer have the time or inclination to determine product advantages and differences, instead it’s only dramatization and polarization that have the power to catch our eye and move the needle. Maybe the only thing that works is more feelings and less facts – regardless of whether those feelings are positive or negative. Why is this happening? Blame the 24/7/365 news cycle, blame the commercialization of everything, blame the advertising industry, blame our abbreviated attention spans, blame our smartphone addictions, blame Rupert Murdoch’s news machine, blame the president. Is it possible that our political environment has not only changed itself but has also changed our commercial environment? Or is it that the same forces that affect the way we vote also affect the way we buy? Emotion, not reason, is why products sold in blue boxes wrapped in white ribbons pushed Tiffany’s revenue to $911 million in the last quarter, resulting in sterling per share earnings of $0.73 cents and a share price increase of 8%. All while enabling the firm to enjoy a 59% profit margin, far above most other retailers. Emotion, not reason, is why Birken Bags sell for $12,000 to $200,000. Emotion, not reason, is why Birkenstock sold 20 million pairs of shoes last year ranging in price from $29.95 to $250.00. It works for the political machine and it works for the auto industry. 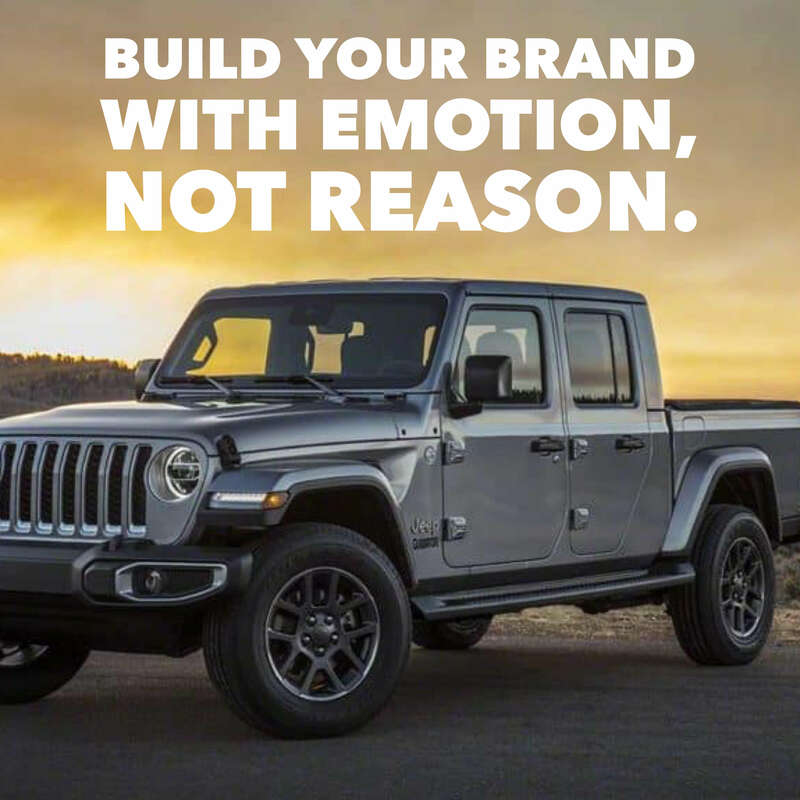 Emotion, not reason, is why Jeep’s Gladiator will sell for up to 25% more than a similarly equipped Ford Ranger or Chevy Colorado. This only leaves one question for you: does your business promote itself using emotion or reason? Fascinating. Good rant Bruce! This is an insightful, and unique, parallel between industries I never would have compared. I like it.